Having worked at both Zia Records and Half Price Books, if there’s anyone who must know a thing or two about used bookstores, the people who shop there, and what it’s like to come across the occasional interesting item, it would be Ashley Naftule. 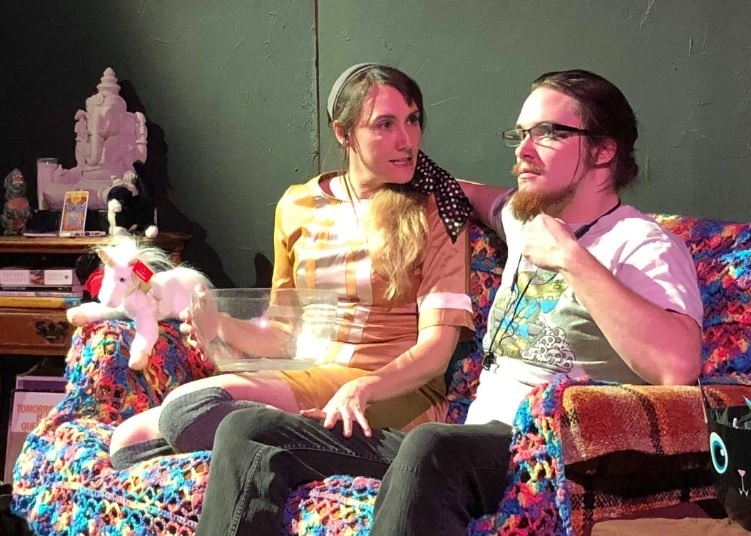 Currently, the Associate Artistic Director for Space 55, the valley’s small, independent theatre group located on N. 18th Avenue, Naftule has written a new play inspired by those years behind the counter, The First Annual Book Burners Convention. With a title like that and an awareness of Naftule’s origins, you might think you’re about to see an off-beat, comedic, behind-the-scenes exposé of the day to day affairs of a used bookstore, its behind the counter secrets, the attitudes of employees towards the customers, and why when during hard economic times you take in boxes of your favorite books, albums, and CDs, and you’re offered a disappointing amount of practically next-to-nothing for them. But you’d be wrong. It starts off that way. It’s November 1st, the morning after Halloween. Francis Neville (Sky Donovan) and his sister Aaron (Dayna Renee Donovan; and yes, that is Aaron Neville, and, no, there’s no singing) both work at the Opera Street Bookstore, a place not unlike Half Price Books where customers raid their home shelves and bring in what will later become the store’s inventory. When Nice Guy Johnny (normally Brett Higginbotham, but ably played at the last minute on Sunday’s matinee by director Dennis Frederick) arrives with a bag full of books to sell, Francis offers him only five dollars for the lot, and that includes an old, musty, ancient looking hard-covered book written in what might be either hieroglyphics or a language of a long, lost past. Actually, Francis pays nothing for the book, insisting its pages are so full of silverfish, the best he can do is get rid of it for Johnny as a free service before it contaminates everything else in the store. But, of course, Francis is lying. There are no damaging silverfish. But the off-beat that was at first just weird, then bizarre, develops into something freakish. There are two others who want that book, and their approach is considerably less diplomatic than Mr. Cold’s. Two sisters, demons from hell (Julie Peterson and Tessa Geelhood) are determined to find the ancient writings, and they’re perfectly happy to torture or tear anyone from limb to limb in order to find it. 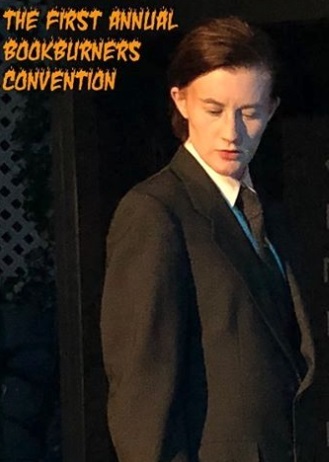 There are times throughout when the play appears to be in danger of going completely off the rails, especially with the demon sisters, two characters who would benefit from some rethinking and a thorough re-write. But with overall good work from its eight-member cast, particularly Sky Donovan – his unsuspecting bookstore worker feels authentic to the point of believing that his day-job outside of Space 55 is actually working at a used bookstore – and Amy Jean Page as Claire, Francis’ sympathetic girlfriend, the dark-humored play is kept buoyant. 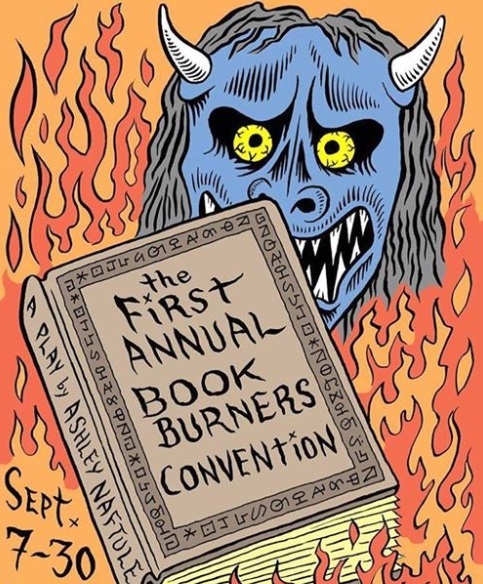 However, it’s fair to say that mainstream audiences attending the low-budget, rough-around-the-edges production will find The First Annual Book Burners Convention an undeniable challenge. 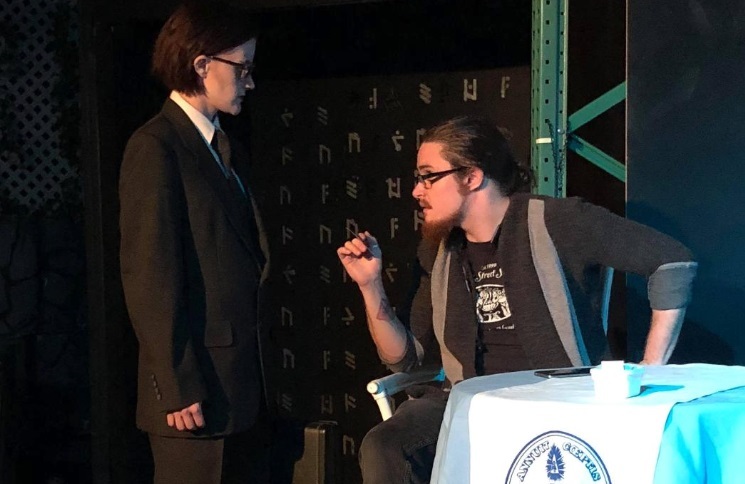 In fact, with its several short and to the point scenes that often jump quickly from location to location, particularly as the story heads towards its intriguing conclusion, the play doesn’t always feel like a play at all. It’s like watching a live-action version of a late-night movie; a black comic horror flick, the kind that develops a cult after surviving the film festival circuit in the Sci-Fi/Horror category. Naftule, who has a good ear for dialog, gives the impression he’s adapted something originally conceived as a screenplay, a notion underlined further by the continuing string of scene-setting music from sound designer Ilana Lydia; it sounds like a movie’s original soundtrack. 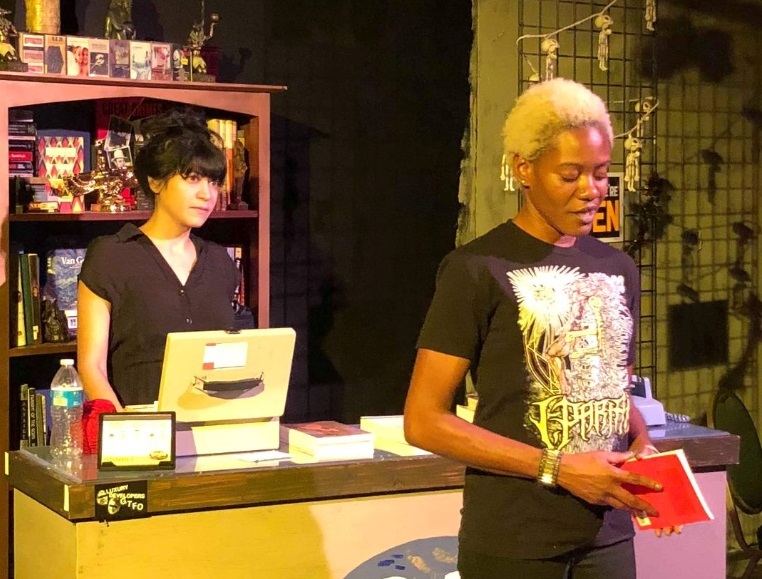 When the manager of the bookstore, Millicent (Marcella Grassa) tells the story of the night she was driving her Nissan and thought she saw the angel Gabriel raising his sword before her, atmospheric music slyly creeps in, adding a flavor of eeriness to the telling. It’s purely cinematic. And, frankly, if at some future date it’s ever adapted to a screenplay, the concept of Book Burners, I’m suspecting, would be considerably more effective if told up on that big screen forum.